Mobile bookcases are a sturdy, practical storage solution. Mobile bookcases are not only a great mobile storage solution, they are also an incredibly sturdy and practical storage solution for any loose items. Due to the demands on the supporting frame, mobile bookcases should always be heavy-gauge steel. The heavy structure can hold up to the weight of books well and, by extension, can support other items like patient supplies, toys or other odds and ends important to clients and guests. Despite their practicality mobile bookcases have a fun side too. Because metal furniture needs a strong finish to prevent chipping and rust, baked enamel paint is a preferred finished and these enamels come in all the colors of the rainbow. As room accessories, mobile bookcases add a punch of color and brightness and are a big hit with kids and adults. Mobile bookcases are equipped with adjustable shelves so there is room no matter what you are storing. As a point of visual interest, a brightly colored mobile bookcase can be added along a wall in combination with additional mobile bookcases in other colors for a bold decorative statement. For care providers, the fact that they are bookcases on wheels and have the ability to effortlessly roll books and other activities to their clients and guests is a great stress relief. 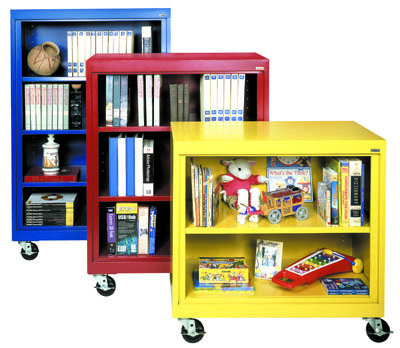 Mobile bookcases are also a great way to create a mobile library to share books and resources within a large facility. When you buy furnitureand accessories for a commercial, heavy-use environment always make sure to deal with a reputable contract furniture provider who will guide you to the right choice, sell you only the highest quality pieces and be there to service you and your facility after the purchase.